14 February 2007: Sometimes it takes just one human being to tip the scales and change the course of history. In 2007, that human being will either move to or be born in a city, and demographers watching urban trends will mark it as the moment when the world entered a new urban millennium in which the majority of its people will live in cities. It will also see the number of slum dwellers cross the one-billion mark, when one in every three city residents will live in inadequate housing, with no or few basic services. Three important trends characterize the urbanization process in this new urban era. Firstly, the biggest cities will be found mainly in the developing world. ‘Metacities’-the massive conurbations of more than 20 million people above and beyond the scale of megacities-are gaining ground in Asia, Latin America and Africa. Home to only four per cent of the global population, most of them have grown at the relatively slow rate of about 1.5 per cent annually. However, the sheer size of these urban agglomerations points to the growth of city-regions, as well as to ‘metropolitanization’, which calls for more polycentric forms of urban governance and management and stronger inter-municipal relations. The scale of environmental impact of metacities and megacities on hinterlands is also significant and is likely to be a cause for concern in the coming decades. Secondly, despite the emergence of megacities, the majority of urban migrants will move to small towns and cities of less than one million inhabitants. More than half of the global urban population lives in cities of less than 500,000 inhabitants, and almost one fifth in cities of between one million and five million inhabitants-these intermediate places are predicted to grow at a faster rate. Natural population increase, rather than migration, is becoming a significant contributor to urban growth in many regions, as is reclassification of rural into urban areas. However, the relative absence of infrastructure, such as roads, water supply and communication facilities, makes many cities less competitive and leads to a lower quality of life for their citizens. Thirdly, cities of the developing world will absorb 95 per cent of urban growth in the next two decades, and by 2030 will be home to almost four billion people, or 80 per cent of the world's urban population. After 2015, rural population will begin to shrink as urban growth becomes more intense in cities of Asia and Africa, which are set to host in 2030 the largest urban populations, 2.66 billion and 748 million, respectively. Poverty and inequality will characterize many developing-world cities, and urban growth will become virtually synonymous with slum formation in some regions. Asia is already home to more than half of the global slum population (581 million), followed by sub-Saharan Africa (199 million), which has both the highest annual urban growth rate (4.58 per cent) and the highest slum growth rate (4.53 per cent), and Latin America and the Caribbean (134 million). The continued threat of conflict in several African countries is a significant contributing factor in the proliferation of slums in urban areas. The prolonged crisis in southern Sudan, for instance, has led to the mass exodus of rural communities to the capital Khartoum, which accommodated almost half of the more than 6 million internally displaced persons during the late 1990s. These trends will most likely continue to concern policymakers in the developing world as they confront the reality of growing inequality and poverty in their cities. However, urbanization can also be a positive force for human development. Highly urbanized countries tend to have higher incomes, more stable economies, stronger institutions and are better able to withstand the volatility of the global economy. In both developed and developing countries, cities generate a disproportionate share of gross domestic product and provide extensive opportunities for employment and investment. Evidence suggests that despite their enormous potential to bring about prosperity, the wealth they generate does not automatically lead to poverty reduction. On the contrary, inequalities between the rich and the poor in many cities have grown, as have the size and proportion of slum populations. Although poverty remains a primarily rural phenomenon, it is quickly becoming a severe, pervasive and largely unacknowledged feature of urban life. Large sections of the urban population are suffering from extreme levels of deprivation. The UN Human Settlements Programme (UN-HABITAT) analyses show that incidence of disease and mortality is much higher in slums than in non-slum urban areas and in some cases, for example HIV prevalence, is equal to or even higher than in rural areas. Inequality in access to services, housing, land, education, health care and employment opportunities within cities have socio-economic, environmental and political repercussions, including rising violence, urban unrest, environmental degradation and underemployment, which threaten to diminish any gains in income and poverty reduction. The State of the World's Cities Report 2006/7 provides an overview of issues linking cities, slums and the Millennium Development Goals (MDGs). It also makes clear that the global fight against poverty is heavily dependent on how well cities perform. The report highlights three interrelated issues: the MDGs give an apt framework for linking the opportunities provided by cities with improved quality of life; the achievement of the MDGs depends on the governments' capacity to speed up progress in reducing urban poverty and inequality and in reversing current trends in slum formation; and improving the living conditions of slum dwellers will automatically have a positive impact on the attainment of most of the MDGs and their related targets. • In low-income countries, such as Bangladesh, Ethiopia, Haiti, India, Nepal and Niger, 4 out of 10 slum children are malnourished. • In some cities like Khartoum and Nairobi, the prevalence of diarrhoea is much higher among slum children than those in rural areas. Child deaths in slums are attributed not so much to lack of immunization but more to inadequate living conditions, such as lack of access to water and sanitation or indoor air pollution, which leads to water-borne and respiratory illnesses among children. • Malnutrition and hunger in some slum areas is almost the same as in villages. In India, for instance, slum dwellers suffer slightly more than the rural population from malnutrition. • Recent data on HIV/AIDS show that in various sub-Saharan African countries, HIV prevalence is significantly higher in urban than rural areas and also higher in slums than non-slum urban areas. 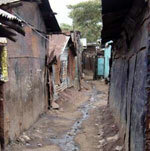 Moreover, slum women are particularly at risk, with higher HIV-prevalence rates than that of both men and rural women. • Age pyramids for slum and rural populations in several countries show similar patterns. Both groups tend to be younger and generally die earlier than non-slum urban populations, which tend to have the lowest child mortality and the highest life expectancy rates. Studies have shown that children living in a city slum are more likely to die from pneumonia, diarrhoea, malaria, measles or HIV/AIDS than those living in a non-slum area due to poor living conditions. In many cases, poverty, poor sanitation and indoor air pollution make slum children and women more vulnerable to respiratory illnesses and other infectious diseases. For many slum dwellers, overcrowding and living in hazardous areas, including the threat of eviction, affect their livelihood. There is also a strong correlation between where people live and their chances of finding a job. A study in France showed that job applicants residing in poor neighbourhoods were less likely to be called for interviews than those who live in middle- or high-income neighbourhoods. Another study in Rio de Janeiro found that living in a favela was a bigger barrier to gaining employment than being dark-skinned or female-a finding which confirms that ‘where we live matters’ when it comes to health, education and employment. These findings also reveal ‘a tale of two cities within one city’. Slums are not only a manifestation of poor housing standards, lack of basic services and denial of human rights, but are also a symptom of dysfunctional urban societies, where inequalities are not only tolerated but allowed to fester. This report unfolds a new urban reality, showing how poor living conditions impact slum dwellers: they die younger, experience more hunger, have less or no education, have fewer chances for employment in the formal sector and suffer more from ill-health. The international community cannot afford to ignore slum dwellers, as they represent the second largest target group, after rural populations, for development interventions. The MDGs therefore have to target this disadvantaged and vulnerable group. The growth of slums in the last 15 years has been unprecedented. In 1990, there were nearly 715 million slum dwellers in the world. By 2000, the slum population had increased to 912 million and to approximately 998 million today. UN-HABITAT estimates that if current trends continue, it will reach 1.4 billion by 2020. One of every three city dwellers lives in slum conditions; some slums become less visible or more integrated into the urban fabric as cities develop and income improves, while others become permanent features of urban landscapes. Slum dwellers often live in difficult social and economic conditions, but not all suffer from the same degree of deprivation. UN-HABITAT uses an operational definition of slums, one with measurable indicators at the household level. Four indicators measure the physical expressions of slum conditions: lack of water, lack of sanitation, overcrowding and non-durable housing structures. These indicators, also known as shelter deprivations, focus attention on the circumstances surrounding slum life, depicting deficiencies and casting poverty as an attribute of the environment in which slum dwellers live. The fifth indicator-security of tenure-has to do with legality, which is not as easy to measure or monitor, as the status of slum dwellers often depends on de facto or de jure rights, or lack of them. Knowing how many slum dwellers there are in cities and what shelter deprivations they suffer from makes it possible to design interventions that target the most vulnerable urban populations. It is estimated that 133 million people living in cities of the developing world lack durable housing. Over half of the urban population in non-durable or non-permanent houses resides in Asia, with northern Africa having the least number. However, analysis shows that global figures on housing durability are highly underestimated, because durability is based primarily on permanence of structures and not on location or compliance with building codes. Moreover, estimates take into account the nature of the floor material only, as information on roof and wall materials is being collected in very few countries. Figures indicate that over 90 per cent of the world's urban dwellings have permanent floors, but when combining estimates for floor, roof and wall materials, the number drops dramatically in several countries. In Bolivia, for example, 83.8 per cent of the urban population is counted as having durable housing when only floor material is considered, but when wall and roof materials are also taken into account, it drops to 27.7 per cent. Statistical analysis in the report shows that when physical structure variables are combined, the results provide a more realistic image of housing durability. Overcrowding is a manifestation of housing inequality and is a hidden form of homelessness. In 2003, approximately 20 per cent of the developing world's urban population, or 401 million people, lived in houses that lacked sufficient area, i.e. with three or more persons sharing a bedroom. Two thirds of this urban population resides in Asia, half of them or 156 million in southern Asia. The report shows how living conditions, including overcrowding and poor ventilation, are related to increase in rates of illness, child mortality and negative social behaviours. It stresses that the risk of disease transmission and multiple infections becomes substantially higher as the number of people crowded into small, poorly ventilated spaces increases. Although official statistics reflect better water coverage in urban than rural areas, surveys show that in many cities the quantity, quality and affordability of water in low-income urban settlements fall short of acceptable standards. Improved water provision in urban areas was reported to be as high as 95 per cent in 2002. However, ‘improved’ water provision does not always mean that water is safe, sufficient, affordable or easily accessible. Further analysis reveals that getting water from a tap is a luxury enjoyed by only two thirds of the global urban population. Less than half (46 per cent) have piped water within their dwellings; 10 per cent rely on public taps; and 8 per cent have access only to manually pumped water or protected wells. Inter-regional differences indicate that Africa has the lowest proportion of urban households with access to piped water (38.3 per cent), while Latin America and the Caribbean has the highest (89.3 per cent). In Addis Ababa, Ethiopia, a UN-HABITAT survey showed that the proportion of low-income urban residents with access to water dropped from 89 to 21 per cent when the definition of ‘access’ included such variables as cost and quality. Poor water access has a direct bearing on rates of water-borne or water-related diseases in urban areas. Over 25 per cent of the developing world's urban population, or 560 million residents, lack adequate sanitation. Asia accounts for over 70 per cent, mainly because of the large urban populations of China and India. UN-HABITAT analysis shows that while cities in south-eastern and southern Asia have made significant progress to improve sanitation coverage in urban areas, in cities in sub-Saharan Africa and eastern Asia, 45 per cent and 31 per cent, respectively, of the urban population still lack access. However, some countries in southern Asia have extremely low coverage, notably Afghanistan, where only 16 per cent of the urban population have access to a proper toilet. Hundreds of thousands of people die every year as a result of unhealthy living conditions due to lack of clean water and sanitation. The number of deaths attributable to poor sanitation and hygiene alone may be as high as 1.6 million a year. A disproportionate share of the labour and health burden of inadequate sanitation falls on women who, for instance, have to wait for long periods to gain access to public toilets. Inadequate sanitation is something of a ‘silent tsunami’, causing waves of illness and death, especially among women and children. Mass evictions of slum and squatter settlements in various cities in recent years suggest that security of tenure is becoming increasingly precarious, particularly in sub-Saharan Africa and Asia, where evictions are often carried out to make room for large-scale infrastructure or city ‘beautification’ programmes. A global survey in 60 countries found that 6.7 million people had been evicted from their homes between 2000 and 2002, compared with 4.2 million in the previous two years. Many of these evictions were carried out without legal notice or due process. Improving the tenure of urban households could prevent evictions, but operationalizing security of tenure for global monitoring remains difficult. It is neither possible to obtain household data on secure tenure in most countries nor to produce global comparative data on various institutional aspects of secure tenure, as such data is not regularly collected by censuses or surveys. However, non-empirical information suggests that between 30 and 50 per cent of urban residents in the developing world lack security of tenure. Although home ownership is regarded as the most secure form of tenure, evidence suggests that ownership is not the norm in both developed and developing worlds, and is not the only means to achieve tenure security. In fact, informal (or illegal) growth has become the most common form of housing production in the developing world, where gaining access to housing through legal channels is the exception to the rule for the majority of poor urban households. UN-HABITAT and its partners are currently working on a global monitoring system that could provide a framework to assist local and national governments to produce estimates on how people have secure tenure, using an agreed-upon methodology in terms of definitions, indicators and variables. Since the first UN Conference on Human Settlements (Habitat I) in Vancouver, Canada in 1976, the international community has adopted and implemented a range of policies and programmes with mixed results. Many were unsuccessful and others, while successful at the pilot stages, could not be scaled up and remained small ‘islands of success’, which did not have a significant impact on urban poverty levels or slum-growth rates. Getting urban poverty on the development agenda has been a struggle in the last thirty years. Silence or neglect has characterized most policy responses. However, with the adoption of the Millennium Declaration in 2000, urban poverty is being brought to the centre stage of the global development agenda. As part of its mandate to assess the countries' performance on MDG 7, target 11-to improve the lives of at least 100 million slum dwellers by 2020-UN-HABITAT has built a broad architecture for global monitoring and reporting, and has evaluated more than 100 countries to see if they were ‘on track’, ‘stabilizing’, ‘at risk’ or ‘off track’, vis-à-vis the slum target, using three criteria: annual slum-growth rate, slum percentage and slum population. The results revealed some interesting findings. Countries that had successfully reduced slum-growth rates, slum proportions and slum populations in the last 15 years shared many attributes. Their Governments had shown long-term political commitment to slum upgrading and prevention; many had undertaken progressive pro-poor land and housing reforms to improve the tenure status of slum dwellers and their access to basic services; most used domestic resources to scale up slum improvements and prevent future slum growth; and a significant number had put in place policies that emphasized equity in an environment of economic growth. In many countries, improvements in just one sector had a significant impact on slum reduction, particularly in cities where inhabitants suffered from only one or two shelter deprivations. Another major finding showed that countries doing well in managing slum growth had highly centralized systems and structures of governance. Even in cases where decentralized systems existed, policy actions for slum prevention and upgrading were implemented through centralized interventions. This was possible because the central governments could put in place measures and resources to ensure cohesiveness in the design and implementation of slum- upgrading projects and had the capability to put forward legislation and pro-poor reforms that require political support to tackle basic shelter deprivations. They have been able to set up institutional arrangements, allocate important budgets and execute projects to effectively meet targets and commitments. In countries such as Brazil, Egypt, Mexico, South Africa, Thailand and Tunisia, implementation of inclusive policies, land reforms, regularization programmes and commitment to improve the lives of the urban poor were key to the success of slum-upgrading and prevention programmes. These countries have either developed specific policies or integrated slum-upgrading and prevention as part of the broader poverty-reduction policies and programmes, to respond to social imperatives and promote national economic development. Their central governments have played a critical role not only in the physical improvement of slums but also in ensuring that investments are made in other sectors as well, such as education, health, sanitation and transport. This perhaps is a prelude to a change in governance paradigms, in which a more coordinated approach in the development and implementation of policies would be developed, with central governments taking the lead in poverty-reduction programmes, as they have, among others, the mandate and ability to allocate resources to various priority sectors-while local authorities would be able to locally coordinate operational actions. The State of the World's Cities Report 2006/7 clearly shows that not all countries struggling to cope with high slum growth rates have shied away from committing to change. In sub-Saharan Africa, countries such as Burkina Faso, Senegal and the United Republic of Tanzania have shown promising signs of growing political support for slum upgrading and prevention that includes policy reforms in governing land and housing. Some low- and middle-income countries, including Colombia, El Salvador, Philippines, Indonesia, Myanmar and Sri Lanka, which are starting to stabilize or reverse slum growth rates, did not wait to achieve important economic milestones in growth to address slums. They have managed to prevent slum formation by anticipating and planning for the growing urban populations through expanding economic and employment opportunities for the urban poor, investing in low-cost and affordable housing for the most vulnerable groups, and instituting pro-poor reforms and policies that have had a positive impact on people's access to services. They give hope and direction to other low-income countries by showing that it is possible to prevent slum formation with the right policies and practices. What the report reveals clearly is that slum formation is neither inevitable nor acceptable. ‘Running the poor out of town’ through evictions or discriminatory practices is not the answer. Rather, helping the poor to become more integrated into the fabric of urban society is the only long-lasting and sustainable solution to the growing urbanization of poverty. Ultimately, as the developing world becomes more urban and as the locus of poverty shifts to cities, the battle to achieve the MDGs will have to be waged in the world's slums. Eduardo López Moreno is Chief of the Global Urban Observatory at UN-HABITAT. He has over 20 years of academic and professional experience in housing and urban development policies, institutional analysis and urban poverty alleviation issues. He was the Task Manager and principal author of The State of the World's Cities Report 2006/7. Rasna Warah is on the editorial team of the UN-HABITAT publication, State of the World's Cities Report 2006/7, launched at the third World Urban Forum in Vancouver, Canada, in June 2006. She is a Board member of the Society for International Development's Eastern Africa office. If global development priorities are not reassessed to account for massive urban poverty, well over half of the 1.1 billion people projected to join the world’s population between now and 2030 may live in under-serviced slums, says a report published in January 2007. 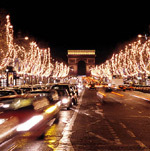 Additionally, while cities cover only 0.4 per cent of the Earth’s surface, they generate the bulk of the world’s carbon emissions, making cities key to alleviating the climate crisis, notes the report. The report ‘State of the World 2007’ by the Washington-based Worldwatch Institute further points out that as recently as a century ago, the vast majority of the world’s people lived in rural areas, but by sometime during 2008 more than half of all people will live in urban areas. Over 60 million peopleroughly the population of Franceare now added to the planet’s burgeoning cities and suburbs each year, mostly in low-income urban settlements in developing countries. Unplanned and chaotic urbanization is taking a huge toll on human health and the quality of the environment, contributing to social, ecological, and economic instability in many countries. Of the three billion urban dwellers today, one billion live in slums, defined as areas where people cannot secure key necessities such as clean water, a nearby toilet, or durable housing. An estimated 1.6 million urban residents die each year due to lack of clean water and sanitation as a result.